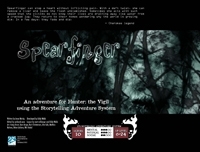 Spearfinger is available now at the Flames Rising RPGNow Shop. Scion: Ragnarök – An Apocalyptic Campaign book for Scion. World of Darkness: Inferno – The Legions of Hell in the World of Darkness.